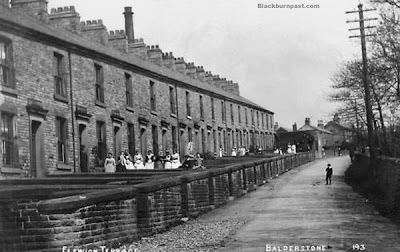 Born in the heart of the town, as I was, Balderstone was one of those rural areas that I always associated with the more affluent, prosperous folks of Blackburn. Though looking at these two black & white images from the 19th century, it obviously wasn't always the case. I know what you mean Colin, I always regarded Balderstone in the same way as yourself and on similar lines to Salesbury. Although the houses in the top photo look to have been better built than the mill workers houses in most parts of working class Blackburn were built, just look at the size of their front gardens !They obviously belonged to the factory workers judging by the nearness of the factory chimney in the background. I've just looked at the 1912 Directory for Balderstone but I can't find who owned it, in fact most of the occupations (Not surprisingly) were Farmers. Is the Woman second from the right in the bottom picture "Old Mother Riley" !! I had a peep in my own directories John, to see what I could find out before I posted the pics, but they don't tell you much do they? It is Old Mother Riley in the lower photo, he/she was still living on Elswick Terrace right through to the late 1950's. Those two postcards are of Mellor Brow and there used to be a mill called Elswick mill . The terrace is alled Elswick terrace where the workers lived. Dont know why the cad said Balderstone! Thanks for the information. Also my apologies for your comment being posted late. I have been having lots of problems with my computer lately. Both Anonymous's and the postcard's locations are right really. 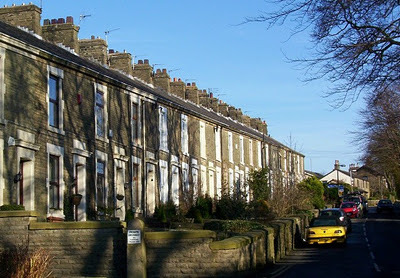 Elswick Terrace is in Balderstone, but as Balderstone is classed as a "County Council Division of Mellor" it could also be said that it's in Mellor. Is Mellor Brow actually in Mellor, or simply the road to Mellor, a bit like Darwen Street leads to Darwen but it's actually in Blackburn. However it's still a nice picture and this Terrace hasn't altered much over 100 years. The postcards are definitely of Elswick Terrace,Mellor. The people are the mill workers who mostly lived in Balderstone, they would have been walking home as there was a path through the fields down to Balderstone. Somebody excavated part of it about twenty years ago. I know all this as my next door neighbour worked in the mill as a child/adult. I used to play in the mill before and after demolition and my parents own the Mill Managers house. Definitely Mellor and not Balderstone. Hi - Thanks for your comment. It all adds to enlighten us. Since posting these two photos / cards back in September 2010, I have walked down mellor Brow a couple of times and I now know where it is (still looks quite similar today really, doesn't it). I had a walk through Mellor yesterday (Mon 16th Jan 12) and had my camera with me, so couldn't resist taking a shot of Elswick Terrace. I came across this as I am doing my family history and know nothing of my father's family. I do not think even he knew much. 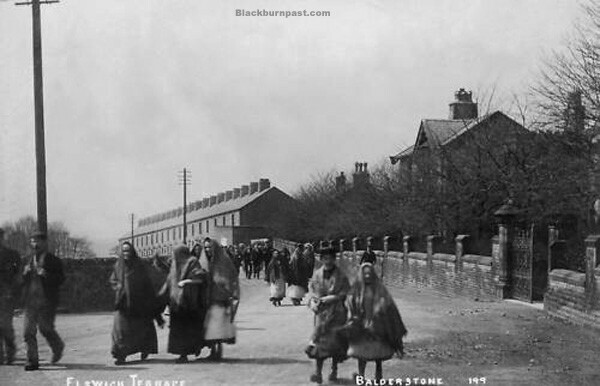 They came from Blackburn and my great grandmother was, by then, widowed and living at 86 Elswick Terrace in 1891. My grandfather - who was 14 at the time of the 1891 census - went on to become a priest having married a girl (my grandmother) from Rishton - one Ada Young.